New Delhi, April 7: Indo-Nepal ties are likely to experience stormy weather in the coming months. Both countries are now under strong leaderships, but the leaderships have contradictory views on China, a new entrant into what was for long, an undisputed Indian domain. 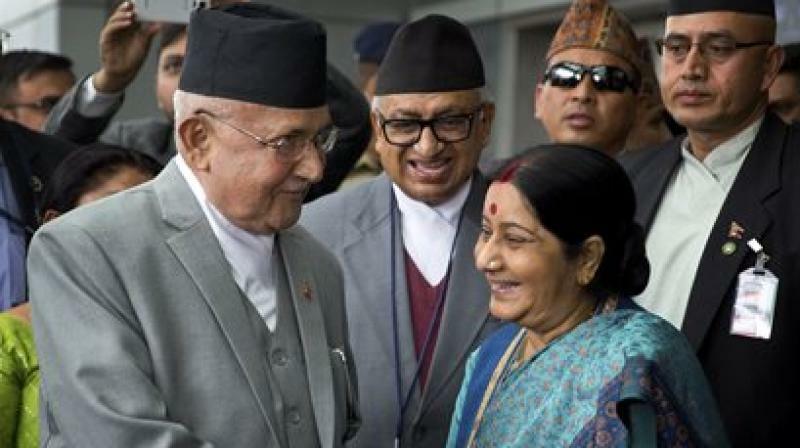 It is in this potentially explosive context that the new and unabashedly pro-China Nepalese Prime Minister, Khadga Prasad Sharma “Oli”, is visiting India at the head of a 60 member delegation from April 6 to April 8, writes P.K.Balachandran in The Citizen. Backed by a high degree of legitimacy conferred by a strong showing at the December 2017 parliamentary elections, Oli is now in New Delhi with an intention to reset ties with India in a manner that will ensure the sovereign equality of the two countries, replacing the Master-Client relationship that has existed traditionally. The no-nonsense an outspoken Nepalese Prime Minister is leading a comprehensive delegation, indicating that the three day visit will tackle a variety of issues. Gyawali pointed out that India is hosting around seven to eight lakh Nepalese and Nepal is also hosting a similar number of Indian citizens. Indians living and working in Nepal are sending home huge sums of money in remittance, the fourth highest figure overall that India receives from across the globe. Thousands of Nepalese youth are serving in the Indian Army and thousands of Nepalese are laboring in various parts of India. “This means we (Nepalese) are contributing a lot to India. Therefore the time has come to change the discourse that Nepal is merely a recipient,” Gyawali said. But India is likely to take a tough stance given its growing sensitivity to China’s inroads. According a recent New Delhi-datelined report, India will indicate to Nepal the “red lines” which the latter should not cross in its dealing with rival China. More specifically, India will tell Nepal that if it gives the US$ 2.5 billion Budhi Gandaki dam project to China, it will not buy power generated by it. The report quoted an un-named high official as saying that Nepal cannot give the dam contract to China and at the same time expect India to buy the power generated there. If true, this is bound to alienate the Nepalese and cause friction with India. The Budhi Gandaki project has been a controversial one. It was awarded to China’s Gezhouba Group in June 2017, weeks after the then Prime Minister and Maoist leader Pushpa Kamal Dahal ‘Prachanda’, decided to join China’s Belt and Road Initiative. But OBORI was a red rag to India. But with the pro-China Oli taking over in 2018, a U-turn appears likely. Indeed, Oli told the South China Morning Post that he intends to revive the Budhi Gandaki project and rid it of all political overtones and undertones. “Political prejudice or pressure from rival companies may have been instrumental in scrapping the project. But for us, hydropower is a main focus, and come what may, we will revive the Budhi Gandaki project,” he said. Oli may be inclined to give the hydel project to China to lessen Nepal’s dependence on oil imports via India. The flow of petroleum can be stopped by India, as indeed, the latter did in 2015 with devastating effect. India had supported the border blockade called for by the Indian Origin Madhesia community living in the Terai region bordering India. 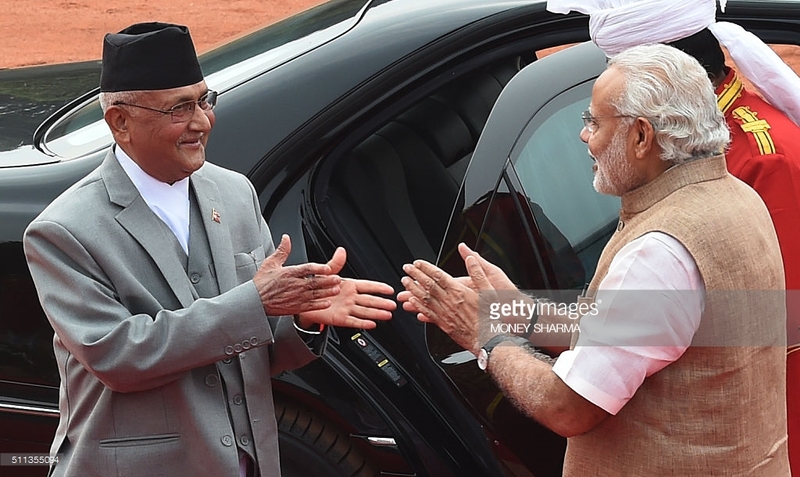 There is also some controversy in Nepal about the timing of Oli’s visit to India. It is alleged that the visit had been announced unilaterally by New Delhi, not giving enough time to Oli to prepare. China-Nepal expert, Prof.B.R.Deepak of Jawaharlal Nehru University, wonders if Oli would be able to wangle any concessions from India or convince New Delhi that Nepal’s relations with China is purely development oriented with no geopolitical or strategic undertones. Conversely, he wonders if Indian Prime Minister Narendra Modi would be able to give significant concessions in a pre-election year and introspect on why a culturally close neighbor like Nepal has moved away from India. In his article in The Dialogue Prof.Deepak observes that despite being a new comer, China is more deeply embedded in Nepal than India. According him, at the November 2017 Nepal Investment Summit, 89 Chinese companies had pledged a total investment of US$ 8.3 billion while a total of 21 Indian companies pledged only US$ 317 million. China is executing projects such as the Pokhara airport ( US$216 million); Melamchi Water Supply Project (US$ 294.4 million); and the Lumbini Project (US$ 3 billion) which will have an airport, hotels, a convention centre, temples and a Buddhist University plus a connecting highway. The US$ 2.5 billion Budhi Gandaki hydroelectric project that Nepal scrapped last year, is certainly going to be given back to China, he says. And the 750 MW project on the West Seti River is being built by China. Deepak points out that while China has earned a name for executing promised projects, India has been dragging its feet in the most embarrassing manner. “By signing of the Belt and Road Initiative with China, Nepal would be connected even better with China through rail, road, dry ports, optical fiber so and so forth,” Deepak says. One of Nepal’s grievances is that it cannot buy arms from China because of India’s opposition. Deepak recalls that in 1989, when Nepal imported arms from China, India closed 13 of the 15 transit points on the India-Nepal border, causing hunger and anger in Nepal. However since then, regardless of India’s opposition, Nepal has been buying Chinese arms .In April 2017, it even conducted a joint exercise with China named “Sagarmatha Friendship 2017”. China has made cultural inroads into Nepal, while India has taken its cultural ties with that country for granted. “China has invested $80 million to boost its soft power in Nepal. Dozens of China Study Centers, a Confucius Institute in Kathmandu University, and a few Confucius Classrooms are imparting Chinese language and culture training to thousands of Nepalese. The Confucius Institute alone has trained over 20,000 Nepalese in a decade,” Prof.Deepak points out. The China scholar, however, adds a word of caution. Nepal cannot completely disregard India’s concerns because alienating India might result in many of the 15 transit points being closed along the 900 km Nepal-India border. And that had happened a number of times since the 1960s hurting Nepalese interests. But India could do more to keep Nepal with it. India needs strengthen its domestic economic base, build capacities and make it attractive to its neighbors and the world, to match China’s capabilities in the region, Deepak says. And until that happens, India will have to show magnanimity in its disputes with Nepal; have a selective approach to China’s Belt and Road Initiative, and reap benefits from bilateral and multilateral engagements with China, with a view to strengthening its economy, he suggests.